My friend Jo hit on a lovely idea to celebrate her birthday. She had heard about a new tearooms that have opened at Holden Clough Nurseries near Bolton By Bowland. And they prepare an Afternoon Tea with a twist ! A Picnic Bench Afternoon Tea. Yummy ! 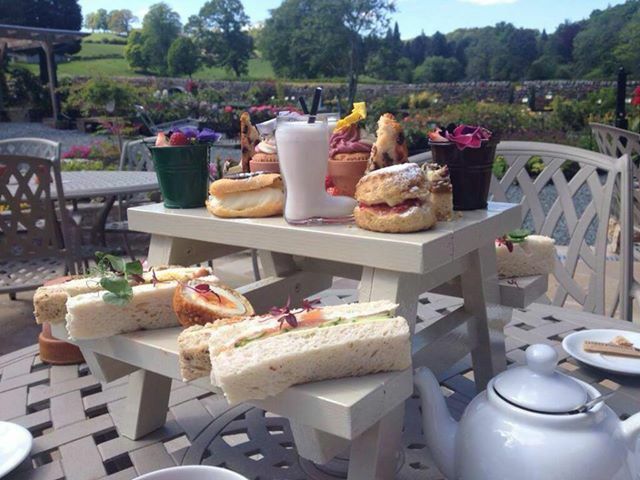 The Garden Kitchen is a newly built tea rooms that serves delicious locally sourced produce in the heart of the Ribble Valley. As it was a sunny day ( hurrah ! ) 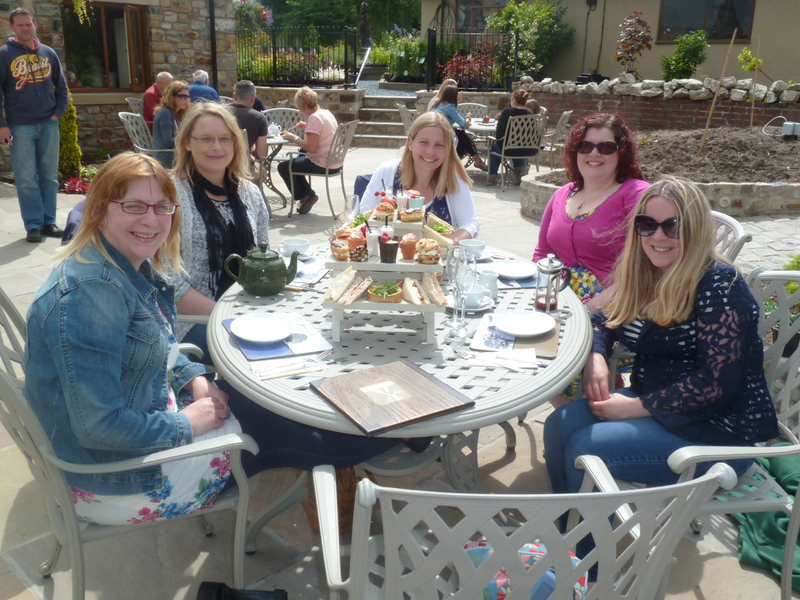 we decided to sit outside and enjoy the sunshine and pleasing views of pretty flowering plants and shrubs. The Birthday Girl ready to tuck in. 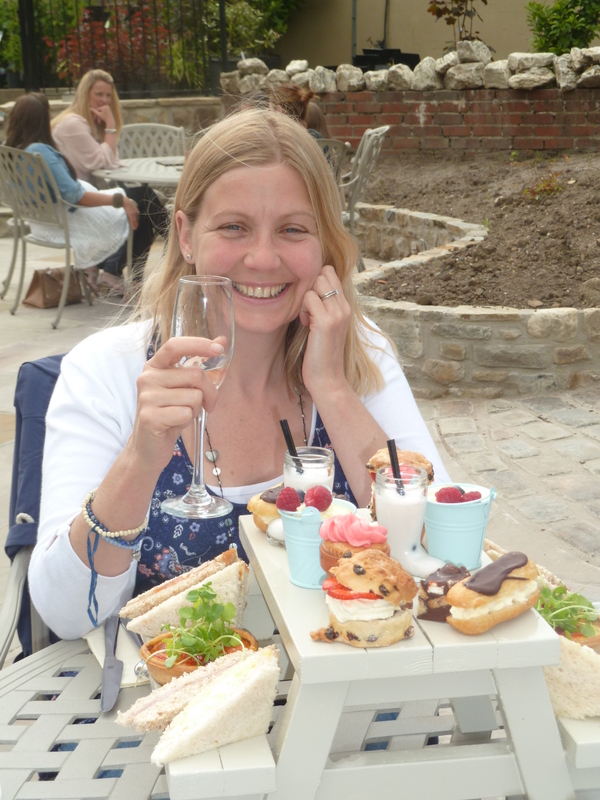 The Afternoon Tea is served on a mini Picnic bench which really blends in with the charming ambiance of dining out at the nurseries. There are a selection of dainty finger sandwiches,heavenly homemade quiches and of course some truly decadent and divine cakes and desserts, including cute little cupcakes served in plant pots,ravishing rocky road,exquisite eclairs and strawberry milkshake that you sip from a straw out of a dinky pot wellington boot. After our leisurely lunch we thought we had all better pretend to be gardeners and peruse the plant section ! To Jo’s delight she found an Azalea shrub with her name on it. A Johanna Azalea ! Unfortunately I did not spy any of my namesake ,the Rose of Sharon. I opted for a Sea Holly instead. Previous PostFarewell my little friend. ^^Next PostChilled Camping Trip in the Yorkshire Dales. Wow loving the bench tea!